For days on end, I’ve been trying to get myself to write a post here and in my craft blog, but the truth of the matter is, life had me sidelined by more pressing matters that needed immediate attention, and we sometimes have to pause other portions of our lives to deal with it. 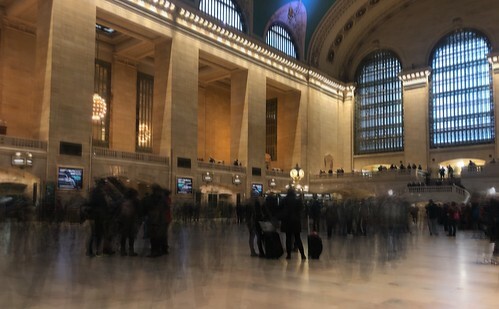 I love how this multi-frame pic came out, achieving overlaps and shadows of the typically busy scene at the grand concourse of Grand Central Station. I picked a corner and tried to hold the camera still. I wanted to capture the movement of the people but keep the building itself as a steady backdrop to the action. It captures what I sometimes feel going through my head or my heart or both. I’ve been trying to sit with unsettling feelings instead of wasting time fighting them off. It works for me. So yes, I’ve been listening to my meditation guide and trying to imbibe what he is urging me to do, although it has been days since I took the time to meditate. (NOTE TO SELF: meditate.). I never quite realized that avoidance takes more effort that just acknowledging the feeling and letting yourself settle with it. I try. Meanwhile, I have set a few goals for the weekend, but mostly putting my house in order— literally. I have projects waiting which I will write about in my other blog, and I look forward to just resting and recharging. To me that means going through my magazines, maybe reading a chapter or two and creating. We all have our means of coping, and fortunately for me, I had long ago identified what takes me to that place of calm. It’s quiet. This weekend is mine. And while I enjoy weekends spent with my boy, I like the silence and the space to just think and worry about me. I don’t need to worry about taking care of anyone, just this weekend and days like this. I can venture out and go to the city, or do something different and maybe visit a museum or just go window shopping, but the gusts blowing outside make me yearn for the coziness of home. And more and more, I find that the quiet moments help me to deal with the noise when I return to the world come Monday. I have also just returned to posting on social media again — and I am many posts behind. I’m getting there. Sometimes I think I should just post the pictures, no hashtags, no blurb. But just as I blog more for myself than for anything at else, I need those tags to remind me what that moment was all about. Even when I post about a meal I may have had, its more than just that food that was instagram-worthy. It’s more about the feeling of the moment and the company and the conversations and the memories that were made. My boy and I have started a new tradition when his weekends are mine. We now go on a Fridate. He and I are liking the new routine and then we head home together. I take a picture of the food and yet that encapsulates that one evening and the joy it brought. Happy thoughts. I like quiet weekends when I can be alone with my thoughts and just be still. I used to think that I needed to keep myself busy outside to explore and enjoy and experience life. Then I discovered I could do the same without leaving my home. Of course, there are days when I feel the urge to just go out.. I might, tomorrow. Or I might just stay home.. and keep busy. Or maybe I will just rest and recharge. I kind of like it here – me in my corner. Friday came and I was feeling the pressure to do a Friday Five post, but the evening slipped by and I was just having too much fun trying to sort and organize my beads. Sunday evening and I realized I had a Monday Musings post to put together — and I could have — but I wanted to take it easy and enjoy what was left of my weekend. I had spent the weekend indoors, tidying up and doing chores, and binge watching some shows I hadn’t caught up since their return from the winter haitus. I’ve always believed that blogging should be a relaxing and spontaneous activity. At least, it is, for ME. Maybe that’s the reason why I have failed to monetize my writing. I write when I feel like it. I didn’t get to do any of that this weekend, but I feel like I got to accomplish a lot. So this weekend, I forgot about lists and just took care of what was to be done with the things in front of me, instead of me thinking of things to do beyond what was already there. One habit I’m trying to cultivate is dealing with the tasks I can at the very moment it occurs to me that something needs to be done. No more procrastinating and putting off things that can be done this minute. I have this tendency to put off putting away things and leaving them “for later”. They tend to be forgotten. And then they pile up or just end up lying around. I put away what I can and discarded what needed to be thrown away. Much accomplished in that respect! Junk mail tends to float around so nowadays, I don’t even put the mail down “for later”. I sort them as I pick them up and get rid of what I know is not essential. My favorite part of the weekend was just catching up on my favorite TV shows and sorting my beads. I think the weekend was more productive that way.. and I know I can write when I can..
For starters, I managed to draw and assemble a new section avatar. Yay! And rather than aim for a masterpiece, I settled on what I came up with on the first try. I was thinking of spraying it with ink. But then I was afraid the sign pen ink would end up bleeding. I could also take a snapshot of the black and white logo and color it digitally. (just like my Friday Five logo.). Somehow I didn’t feel quite okay with that. Then I remembered my flower collage– and that was that. Before the weekend, I started working on my first multi-page layout. But first, I finally decided I will pull together these sheets of paper I had cut out of binder dividers, assembling them into a 9×15 inch spread. I will pull sections bit by bit so I can work on the layouts without carrying the entire book with me. At the end of the year, I will bind the final project into a solid book. I am optimistic this one will get off the ground, unlike previous attempts after I did my altered book. So back to my multi page layout. I used a lot of multi page layered layouts in my first art journal and I really liked how those gave my art journal a two dimensional feel. I just really love the idea that I’m finally doing another book. There were many things that I failed to do in 2018. Continuing my art journaling was one of them. I am not an artist by any means. I am creative and crafty, but I need to watch a dozen videos teaching me how to draw and practice many hours to come up with a passable sketch. But as personal as any journal is, it’s your own art that matters. It can be stick drawings, purely collage, or a hodgepodge of pre cut or preprinted kits. If you ask me, anything beyond simply writing down a journal entry can be an art journal. I first heard of art journaling from Julie Fei Fan Balzer’s Art Journal Everyday project many years back. (Read more about here.). Then I got into journaling swaps as well which showed me how journal prompts could help you keep writing. For the most part, I preferred to journal day to day about what was going through my head or what I was feeling in my heart at any given point in time. I did the backgrounds ahead and worked on each layout as my entries moved on. I like that pace and hope to do the same with this one. I’m hoping it will be as fulfilling an experience working with an altered book before and shifting to a “create as you go” journal as I assemble this one along the way. Well, I am over the moon that I am here again.. and I am on a roll! The holidays are officially over, so I have turned off the timers and while the lights are still on the window sill and my tree is still up, they will not light up. As a Catholic Christian, the holiday season in my home ends with the feast of the Three Kings, celebrated on the first Sunday after the New Year. Beginning tonight, I will start putting away the Christmas decorations and organize them for next year. I had already gotten rid of the lights that don’t work before the holidays ended, and I did not bother taking all the balls out. I bought a new set in a nice periwinkle shade. So I have my week nights planned out, putting things away. I am starting to read again. I just published my 19 for 2019 list and the first one on the list is my goal of reading 6 books this year. I must have started reading a total of six books (if not more) in 2018 but didn’t get to go beyond the first chapter or so, except for one. I will just pick up from where I left off and try to meet the 6 this year. Reading has always been a form of relaxation for me, and I need the channel to unwind now more than ever. More than the intellectual stimulation, I need the chance to immerse myself in something that doesn’t stress me out. And reading has always been a refuge. Opening a new section on the blog: New York Stories. I have always enjoyed writing about people. A long time ago, I had planned to co-write a blog with a friend featuring stories of people from different walks of life. We were both good writers and the idea was for us to alternate writing about people. It was a good idea that fizzled out, but the idea has always stayed with me. I just want to write about ordinary people at random and tell their story as they tell it to me. There are so many interesting things we see out of the ordinary and the everyday. I have always believed that everyone has a story (or two or three) to tell. And I want to tell those stories and write them somewhere. So to make things easier and to keep the rhythm here going, I think I’ll make it a section here in this space and maybe mirror it on a blog dedicated to it. Or not. Let’s see what happens — a story at a time. It was a jewelry repair weekend for me. As I continue to sort my supplies and work on organizing my stocks, I took the time to repair some of the pieces I have. I started to look at new projects but later decided it was as good a time as any to actually devote time to fixing the broken pieces or just rejoin the chains that needed mending. The full post is really for the other blog, but I feel it worth mentioning here for all the effort that I put into it and how happy I am with the results. I’ve never been one to discard pieces that break and even pairs that are orphaned — there is always some use in another form somewhere. Started the week off on a positive note. The past couple of weeks brought 2018 to a rather stressful and very challenging close for me. I have tried to cope by meditating with Headspace via its app, and that’s one thing that I’ve found effective, although I have to make a conscious effort to keep at it. I usually forego the weekends but I meditated as I woke up and just did it before getting out of bed for both Saturday and Sunday. During the workweek, I usually do it while on the bus– either heading to work or on my way home. It’s a healthy habit to try and spend that quiet time just being. I am trying to stay positive. Sometimes, it isn’t as easy as just sulking — but then it doesn’t get me anywhere. So even if in baby steps, I am trying to move forward. If you look at my navigation bar at the top of this blog, you will find 17 for 2017, but no 18 for 2018. The truth of it is that I had started drafting the 2018 version in January last year but never quite got to finishing the post. So we’re skipping 2018. Looking back now, 2018 seems to have been a year when I did a lot and at the same time where I missed out on a lot. I’ve seen myself changing in many ways — not always for the better — but I have tried to consciously check myself where I needed it. From 2017 to 2019, here goes. 1. Read six books. – Take two. (Or is it three?). I managed to start a couple of books without really finishing any. I have to really be more disciplined about picking up the book and getting to the final page. With my current library, I don’t even have to spend on anything to get this done. I just need to do it with more determination. 2. Travel to one destination outside the tri-state area. – I had made plans to visit friends but nothing came of it. However, I did get to visit Hong Kong again after more than 20 years and rekindled an old friendship. (Blog posts coming soon.). BFF Donna is planning to visit the US again with her family sometime in the summer so all hope is not lost for something closer this year. 3. Learn something new via an actual class. I have been planning to learn another language virtually but have not been able to set aside time. 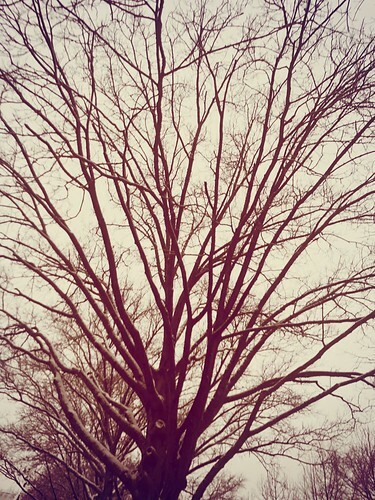 February. Maybe I can also do one academic course via edX. 4. Take better care of myself by exercising, losing more weight. Exercising. This one takes major effort for me and I’m hoping I will be able to take better care of myself , for real, this year. I know that a singe folder, exercising is not just about looking good and feeling good about myself, but more importantly, it’s essential to staying healthy. 5. Visit Central Park all four seasons. A New Yorker for almost 19 years now and I really haven’t gotten beyond visiting Central Park in the Fall, and one time, I believe, winter. I think I will put a reminder in my calendar just to get this going. 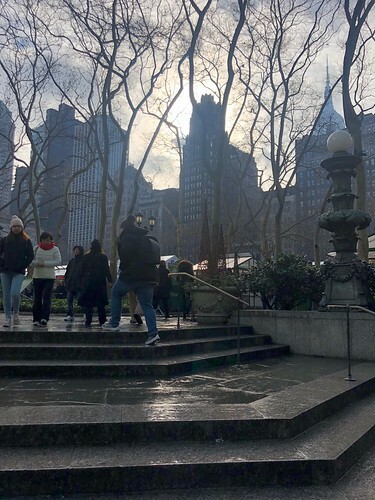 It is one of my favorite places in all of New York, and there is always something different and new to see — but I am always just viewing the fringes from 58th street many blocks down. April. 6. Crafting reboot. I managed to get started on new projects during the second half of 2018 but hope to keep going on a more regular basis. One project every month is a modest goal. I hope to write about it in my craft blog and it will hopefully get me writing on that side on a more regular basis. 7. Destash more systematically. Again, I have achieved some progress with this as I’ve weeded my wardrobe of items that even if they fit me, I don’t see myself wearing again. There were also the reliable staples that have weathered years of wear, and which I am choosing to part with and have someone else enjoy before they lose their appeal. I think I will set aside one weekend to do this every month — not just clothes, but supplies and books and other things. 8. Work on the Gift of 53. When I turned 50 three years ago, I did a project I called “The Gift of 50” which were 50 random acts of kindness to mark my golden milestone. That was quite the project which felt good and which I think I should try again for this year’s birthday, even if it isn’t a milestone date. 9. Write more. For starters, I want to set a goal of posting once a week in the blogs. (Which is principally this one and my craft blog.) – I have to work on this one, more so since my blogging has been severely curtailed because I can now blog only via my smartphone. Work on my other social networking accounts by doing scheduled posts at least once a week. – I have redistributed my focus and have to do this on schedule instead of on a whim. Resume my handwritten projects. Journaling has always been such an outlet of release for me but I haven’t been doing it. Hardly did any in 2018. I am hoping I can go back to this in 2019. 10. Keep snail mail alive by writing a letter or sending out a card at least once a month. If I get to mail the letters I had hoped to send out for Christmas in the next 8 weeks, I will have covered the first 6 of 12 letters I’m aiming for. This one is one of the easier tasks. 11. Rebind my art journal, begin a new one. I had done an altered book beginning 2015 and the pages fell apart and got bulky as I painted and pasted and laid out entries. 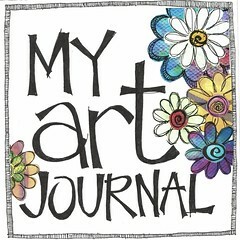 I actually treasure that first art journal and hope to come up with another beginning this month. As always, the hardest part is deciding on the medium. I am thinking I will do a junque or junk journal — piecing together parts as I go along. 12. Sample something new or visit a new restaurant or place (i.e., museum, intallation, etc.) and write about it. I have friends who constantly go out to watch broadway shows, and others who go out of their way to undertake an activity that is art or culture related. There is always actually something going on in this or that museum, but I have to keep track. This December, I was fortunate enough to have caught the tail end of Ailey@60 before it ended and I was just bowled over by the talent and the new experience. Looking forward to more. 13. Publish a postcard set. Towards the end of 2017, I published one of my photos of the Manhattan Skyline featuring a stunning sunset. I would like to publish a postcard set of maybe 6 during the second half of the year. This project means a lot to me as a postcard collector, and I’m hoping I can finally get this done in 2019. 14. Visit at least one lighthouse. Maybe I can tack this on to number 2, traveling to a destination outside the tri-state area — maybe somewhere in the Outerbanks. In addition, I would love to visit the Montauk lighthouse which I have visited maybe 3 times since I became a New Yorker, but which I last saw more than a decade ago. It’s just a bus ride away after all. 15. Encode my poetry. I started doing this on a separate website but have been stalled for lack of time. Maybe I should just tack it on to this blog as a separate section. One thing I take pride in is how I’ve kept this blog alive for almost 15 years. My poetry even goes further and should find a home in these pages. The oldest poem I have was written when I was 9. 16. Visit more blogs / IG accounts. In a way, this is connected to number 1 (reading more), but beyond books. I think while social media has basically been more of a channel for my personal expression, I think it should be a networking hub — business wise or personal. 17. Do a fundraiser for Barangay San Vicente. My mother hails from a very poor community in Sorsogon in the province of Bicol. As a child, we visited our grandmother there. Now that she is older, my mother has chosen to stay there and now lives there permanently. I want to be able to do a fundraiser for the young children there in time for the school opening. If not, for the Christmas season when my mom used to do a gift giving celebration for the young kids. 18. Watch a live show or concert once a quarter. Watching Billy Joel live last October and then the Alvin Ailey Dance Group in December made me realize how much I love being part of the audience, and how I wish I could do that more! So more coming in 2019. If only I could win the lottery for Hamilton, for one! 19. Undertake some home improvement projects. I began this last year by reconfiguring the look of my tiny bathroom, and all it took was removing the ancient shower doors and replacing them with a double bar shower curtain rod. As I move on with this new chapter of my life, it has been refreshing to make changes in a home that is now mine and my son’s. I am excited! 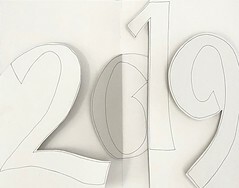 As in previous years, I tag all posts related to this with #19for2019. I also try to do periodic updates just to keep myself in check. I try not to pressure myself too much with the list. I keep telling myself these are goals. Have a happy week ahead, everyone! I don’t really want this to turn into a Monday Musings only blog, but I am beyond thrilled that I am back before the week was up, writing another post. I would like to believe that I’m getting back into the swing of things, even as I’m writing this at past midnight of Sunday, but technically the first minutes of Monday. I am hoping to get up early enough to head into the city to grab a fresh cut of a porterhouse for two.. our noche Buena of choice, between my now growing bigger and taller guy and I. Our New Year’s Eve date. He may be a picky eater, but he is a very discerning carnivore. He knows regular from Angus, so spending on quality steak is not wasted on him. So I’m getting our steak from Cierrelo’s Fine Foods in Grand Central Market— my go to place for quality meats, as is or marinated. My date is not picky with sides– but he does prefer his steak with rice and a side of corn. That’s it. No fancy mash or vegetables, but I will prepare some for myself beyond the Almost perfect mash potatoes I ordered from Fresh Direct. I bought a half bottle of champagne because I will end up drinking more than half of a full bottle if I dared, and I’m hoping to whip up some fruit salad, Filipino style, if I get back in time. Most stores close early this time of the year to give their employees a chance to go home to their families to celebrate, so I’m hoping for an early start myself. Organize my craft supplies. This seems like a never ending project but it is a must when you are sourcing materials constantly and trying to come up with new designs. I had stopped making new pieces before the holidays as work got busy. I have also been updating my listings in my Etsy Shop by providing tags that would help buyers find my store. I know I have to step up the social media marketing as well, but there are only so many hours in a day. I am trying.. Feeling grateful. Although the year had its challenges, I am grateful for a lot of things and I feel truly blessed. I am trying to look forward to 2019 with optimism and hope. I know it can only get better. Here’s my New Year’s Greeting from NYC, taken December 31, 2018. Can you believe it’s Christmas already? In a few days it will be 2019 and we get to start over. I’m all giddy about the fact that I’m back here so soon after the last post, and I’m hoping the writing streak holds. Just random blurbs here on things I feel like writing about, although not as a full blog post. So even if this was meant to post Monday — and of course the Christmas Eve prep and all got in the way — I thought I’d try and finish it and just publish whatever I come up with. Rainy Christmas Eve Monday. I woke up to a cloudy day which turned out to be a bit of a drizzle later, and I had to hop on the bus to grab some last minute items for Christmas dinner with my guy. The sun started peeking out by the time I got to Manhattan, and while the clouds seem to be bent on staying, it’s a rather mild day. Lucky for the tourists roaming the city — and there were a lot of them. Days like this make me miss home. It was always busy on Christmas Day as our relatives came for Christmas breakfast, or for some, lunch. It was a big production for us — with mom’s famed Karekare (Ox tail in peanut sauce) and her Leche Flan and Fruit salad. Of course we couldn’t have Christmas breakfast without the Spanish chocolate and quezo de bola! It has been a while since I celebrated Christmas back home– it was back in 2013, and that wasn’t exactly a happy Christmas for me at the time. But my holidays have changed dramatically since, and I am back into the spirit of having a merry time. Reviving my art journal. I tried in 2018 and that ended up nowhere. I had an art journal that I had worked on and which I hope to re-bind, and it helped me in many ways during a very trying and difficult time. The relaxation and the de-stressing it provided me, and now, the memories and realization of how far I’ve come have made the entire exercise very meaning to me. While I may be in a much better place right now compared to where I was when I was working on it back then, I think the positivity and joy should be documented and expressed with the same fervor as those negative emotions. Fingers crossed! Destashing. For starters, I gave away a coat to the coat drive in Grand Central terminal. I have weeded through my clothes and continue to go through it, and three bins laters, I have one balikbayan box full of clothes to send back home. I went past the “Does this still fit me?” Criteria and simply went with “Will I wear this again in the next 12 months?” Sometimes there is such a compulsion to hold on when what we really must do is let go. I would rather see my clothes make someone else happy or find some use in someone else’s closet. I’m hoping to continue to simplify goals and life in general — and hopefully have a more balanced self in the year ahead. What are you doing to make things better for you?